Graced with nearly 200 full-color illustrations, "A Rich Spot of Earth" is the first book devoted to all aspects of the Monticello vegetable garden. Hatch guides us from the asparagus and artichokes first planted in 1770 through the horticultural experiments of Jefferson's retirement years (1809�1826). The author explores topics ranging from labor in the garden, garden pests of the time, and seed saving practices to contemporary African American gardens. 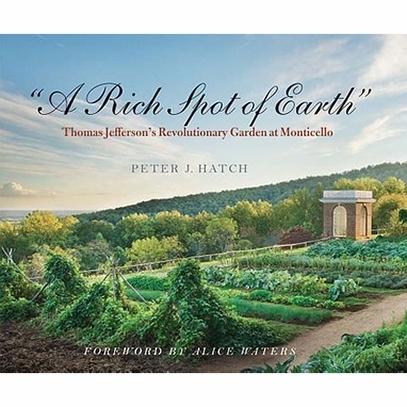 He also discusses Jefferson's favorite vegetables and the hundreds of varieties he grew, the half-Virginian half-French cuisine he developed, and the gardening traditions he adapted from many other countries. As former Director of Gardens and Grounds at Monticello, Peter J. Hatch was responsible for the maintenance, interpretation, and restoration of its 2,400-acre landscape. He has written several previous books on Jefferson's gardens and is an advisor for First Lady Michelle Obama's White House kitchen garden. He lives in Charlottesville, VA. Paperback, 280 pages.